Start thinking now about a wonderful international service opportunity in the name of Christ! 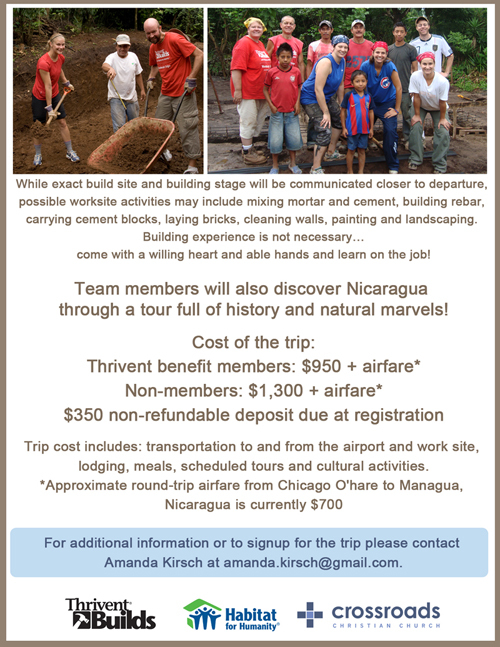 A team of Crossroads’ members are participating in a ThriventBuilds with Habitat for Humanity trip to Nicaragua this November. The team is looking for financial and prayer support as they prepare to embark on this journey to be God’s hands and feet. Contact Amanda Kirsch amanda.kirsch@gmail.com for details on assisting the team or if you’re still interested in joining the team.